rapid chemical reaction of two or more substances with a characteristic liberation of heat and light; it is commonly called burning. The burning of a fuel (e.g., wood, coal, oil, or natural gas) in air is a familiar example of combustion. phenomenon associated with the chemical reaction of a gas that has been heated above its kindling temperature with some other gas, usually atmospheric oxygen (see combustion). ..... Click the link for more information. , the fire bringer. The theft of fire is a common element in the myths of many other cultures. The ramifications of the human ideas about fire are tremendously complex, extending as they do into the concepts about light and the heavens. See J. G. Frazer, Myths of the Origins of Fire (1930, repr. 1971); G. Bachelard, Psychoanalysis of Fire (tr. 1964). There are four elements—Earth, Air, Fire, and Water—associated with the four directions of North, East, South, and West in the magic circle. and also destruction of the outworn. Many traditions of Wicca apply fire to the south and further associate it with the color red and the elementals known as salamanders. Fire is related to reliability, solidity, law, and the order of things. In Ritual or Ceremonial Magic, fire is associated with Michael and with the tarot suit of Wands, and with summer, noonday, and the Hebrew letter Vau. The Parisian Theatre of the Vampires, as shown in Interview with the Vampire, was destroyed by fire. Though not mentioned by Abraham Van Helsing, the voice of knowledge about vampires in Bram Stoker‘s Dracula, (1897) fire was considered the ultimate means of destroying a vampire in eastern European countries. Fire was an ancient symbol of God. For example, God appeared to Moses in the burning bush and once the Hebrews left Egypt, God signaled his presence through a cloud that hovered by day and a fire by night. The fiery destruction of the evil cities of Sodom and Gomorrah was an illustration of God’s power. In the book of Revelations, God was pictured as cleansing the earth by fire at the end of time. Fire was thus both destructive and renewing, consuming the old and corrupt and making way for the new and pure. Throughout the world, fire has been a vital source of light and warmth and integral to food preparation. It was natural for it to take on symbolic and religious meanings. While fire has had a particular meaning and its own rituals in each culture, it has been part of the sacred life of all cultures. In the Mediterranean, the metaphorical description of the soul as a spark of fire added to its sacred quality. Fire also has been used to execute people in some countries—a practice used especially for condemned heretics and witches during the medieval period in Europe. In eastern Europe, from Bulgaria and Romania to Russia and Poland, the body of a suspected vampire was burned if lesser means (the stake, or decapitation) failed to stop it. Throughout Europe, people used a new fire to cure livestock of sickness. When such a fire was to be built, residents would extinguish every individual fire in the village and start two new bonfires a short distance from each other. The people then walked the animals in the village through the new fire, or need fire. Afterwards, they relit the village fires from the embers of the need fire. At times, when a vampire was believed to be attacking cattle and other domestic animals, villagers would resort to a need fire, hoping that would free them from the vampire. It was believed that the fire would cause the vampire to leave the herd and become trapped in the area of the fire, where it then would be devoured by wolves. While not mentioned by Stoker as a way to fight the vampire, fire was used by the author of Varney the Vampyre as the ultimate means of death: Varney jumped into the fiery opening of a volcano. Through the twentieth century, this concept of fire has been picked up in many vampire novels and movies, where it provided a popular option for the vampire’s destruction. Torch-carrying villagers attacking the vampire’s (or other monster’s) lair and burning it to the ground was a common scene in movies of the 1930s and 1940s. More recently, St. Germain, the vampire hero in Chelsea Quinn Yarbro‘s novels, noted fire as one of two means to experience the “true death” of a vampire. For Anne Rice‘s vampires, whose blood was combustible, fire was almost the only way they could be destroyed. Lestat de Lioncourt was introduced to fire soon after he was made a vampire when Magnus, his creator, committed suicide by jumping into a fire before he told Lestat much about the vampiric life. 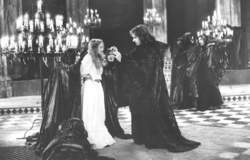 Claudia and Louis used fire against Lestat before their leaving for Europe, and later Louis used fire against the Parisian vampire community when he burned their Theatre of the Vampires. Fire had its most prominent role in Rice’s third vampire volume, Queen of the Damned, where one character notes that fire is the one weapon that vampires can use against each other, and that is exactly what Akasha the ancient original vampire did. She launched a mission against the vampire community and destroyed many before she was herself destroyed. The effectiveness of fire on vampires is carried forward in more recent vampire productions such as the Buffy the Vampire Slayer, Angel, and the “Twilight” series. In the movies, it repeatedly has made for an exciting ending to a vampire chase, occasionally by shoving the vampire into a furnace for cremation. Edmans, Karl-Martin. “Fire.” In Mircea Eliade, ed. The Encyclopedia of Religion. New York: Macmillian Publishing Company, 1987. Ramsland, Katherine. The Vampire Companion: The Official Guide to Anne Rice’s The Vampire Chronicles. New York: Ballantine Books, 1993. 507 pp. The most ancient traces of the use of fire have been found in excavations of Sinanthropus and Neanderthal sites. Apparently man at first made use of fire generated by natural forces, such as lightning or spontaneous combustion of organic matter. Fire was first artificially generated at a much later time, most likely at the beginning of the Upper Paleolithic. Some ancient methods of making fire were scraping, drilling, and sawing, based on the friction of two pieces of wood against one another. Another method was striking sparks from flint. This method was improved at the beginning of the Iron Age with the help of steel and was used until the invention of phosphorus matches in the 19th century. The control of fire “for the first time gave man mastery over a certain force of nature and in this way once and for all separated man from the animal kingdom” (F. Engels, in K. Marx and F. Engels, Soch., 2nd ed. vol. 20, p. 117). At first, fires were used for protection against the cold and predatory beasts, for illumination, and for the preparation of food. Fire evidently also played a significant role in the formation and consolidation of social ties within primitive hordes. First, maintenance of the fire demanded that members of the group perform coordinated duties. Second, all the vital activities of the primitive community were centered around the campfire or hearth. Man later learned to use fire for various technical purposes, such as mining flint, processing timber, and firing clay. Fire occupied an important place in the religious views and in the mythologies of many peoples. Anuchin, D. N. Otkrytie ognia isposoby ego dobyvaniia, 2nd ed. Moscow-Leningrad, 1926. Boriskovskii, P. I. “Osvoenie ognia.” In Kratkie soobshcheniia o dokladakh i polevykh issledovaniiakh In-ta istorii material’noi kul’lury, 1940, book 6. Porshnev, B. F. “O drevneishem sposobe polucheniia ognia.” Sovetskaia etnografiia, 1955, no. 1.
of all types of weapons, a means for destroying an enemy in battle on the ground, at sea, and in the air. The strength of fire lies in its effectiveness and the ability to maneuver quickly and at the right moment. Fire is made effective by accuracy, concentration, surprise in application, and skillful control. Maneuvering of fire involves switching fire from certain targets to others in order to destroy them in sequence or simultaneously and concentrating the fire of various types of weapons against the key targets or sectors. Fire may be from artillery (including rocket, antiaircraft, and ship artillery), tanks, small arms, and other types of weapons. Artillery employs fire on an individual target, convergent fire, the rolling barrage, successive concentrations, the standing barrage, the creeping barrage, and massed fire. Antiaircraft artillery uses convergent and barrage fire against the most important aerial targets. According to extent of damage to be inflicted, artillery employs annihilation fire (the target loses its combat capability completely), neutralization fire (the target is temporarily deprived of combat capability, maneuver is limited, and control is disrupted), and destruction fire against defense installations (the targets are made unsuitable for further use). Artillery wages fire by single rounds, platoon and battery fire, deliberate fire (with appointed time intervals between rounds), volley fire (rounds follow one another as quickly as possible), and salvo fire (all the guns of the battery or battalion fire simultaneously on command). Among small arms, carbines (conventional rifles) wage fire by single rounds, submachine guns fire in short and long bursts or single rounds, and machine guns fire in short and long bursts or continuously. Fire by a squad, a platoon, and sometimes even a company that is opened up simultaneously on the command of the commander is called volley fire and is used against dense enemy combat formations to repulse an attack. Based on the direction of rifle and gun fire a distinction is made between frontal (directed at the front of the target), flank (at the flank of the target), and cross fire (at a single target from at least two directions). Fire by machine guns, individual field guns, and tanks that is opened up by surprise at very close range in one definite direction is called dagger fire in Russian. uncontrolled burning that destroys property and endangers human life. All fires involve the chemical reaction of the burning substance with oxygen in the air, the release of great amounts of heat, and the rapid conversion of the combustion products into gases. Fires extinguished in their early stages and involving no losses constitute about 25 percent of the total number of fires. Only a small percentage of fires are major fires occurring in depots, warehouses, stores, and other places where goods are concentrated; the material damage resulting from these fires is considerable. In the USSR, for example, large fires account for 1 or 1.5 percent of all fires but 60 percent of all fire losses. In the USA, the National Fire Protection Association estimates yearly fire losses at about 3 billion dollars; the figure reaches 11 billion dollars if indirect losses are included. In 1972 in the USA, there were about 2.5 million fires, in which some 12,000 people died and some 300,000 were injured. Fires are most frequently caused by carelessness, misuse of industrial equipment, spontaneous combustion of raw materials and finished products, static electricity, lightning, and arson. Based on where they originate, fires are classified as follows: fires on means of transport, steppe and field fires, underground fires in shafts and mines, peat and forest fires, and fires in buildings and structures. Fires in buildings and structures are in turn subdivided into open fires, in which flames and smoke are highly visible, and closed fires, in which the fire spreads along hidden pathways. The space involved by a fire is arbitrarily divided into three zones: the zone of active combustion, the zone of thermal effect; and the zone of smoke. Externally, the zone of active combustion is marked by flame and glowing or smoldering materials. Oxygen in this zone is usually supplied from the air, although in some cases it results from the thermal decomposition of oxygen-containing combustible substances. Combustible structures and materials at the origin of the fire heat up and ignite as a result of the heat, and noncombustible materials lose their structural strength and warp. The major factor contributing to the destructiveness of fires is the heat that develops as the fire burns. The temperature inside burning houses and public buildings ranges from 800° to 900°C. 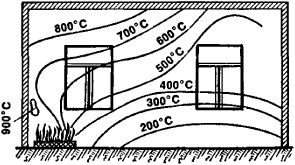 As Figure 1 shows, the heat in a burning room is not distributed uniformly. 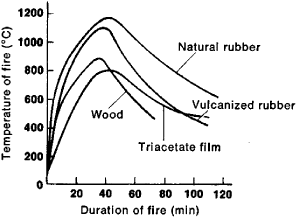 Figure 2 shows the difference in the temperatures of fires in enclosed spaces when various solid substances burn. 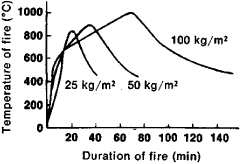 As the amount of combustible material per unit floor area (fire load) increases, the maximum temperature and duration of the fire increases (Figure 3). As a rule, the highest temperatures are generated in open fires and average from 1200°C to 1350°C for combustible gases, from 1100° to 1300°C for liquids, and from 1000° to 1250°C for solids. When Thermit, Elektron (a magnesium-base alloy), or magnesium burn, the maximum temperatures range from 2000° to 3000°C. The heat released in the zone of combustion is transferred to the environment by convective and radiant heat exchange and as a result of thermal conductivity. 80°C and the surface density of the heat flux exceeds 4 kilowatts per m2, or 60 kilocalories per min-m3. 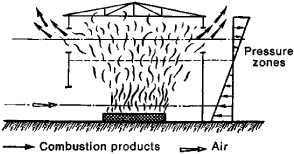 During a fire, significant displacements of air and combustion products occur (Figure 4). The hot gaseous products rush upward, causing an influx of denser, cool air into the zone of combustion. In fires inside buildings, the rate of gas exchange depends on the dimensions and arrangement of openings in the walls and roof, the height of the rooms, and the amount and kind of combustible materials. The direction in which the heated products travel usually determines the way the fire will probably spread, since the intense rising heat currents may carry sparks, hot coals, and firebrands considerable distances and start new fires. The combustion products released during a fire—smoke—create a smoke zone. The composition of smoke usually includes nitrogen, oxygen, carbon monoxide, carbon dioxide, water vapor, and ashes. Many of the products of complete and incomplete combustion found in smoke have high toxicity; this is especially true of products formed when polymers burn. In some cases, the products of incomplete combustion, such as carbon monoxide, may combine with oxygen to form combustible and explosive mixtures. Fires may be extinguished by the action of cooling substances on the surface of the burning materials. Noncombustible vapors or gases may be used to dilute burning substances or air entering the zone of combustion, or a layer of insulation composed of fire-extinguishing substances may be created between the zone of combustion and the burning material or air. Water is the chief means of putting out fires. Streams of water are used to dispel smoke, provide protection from thermal radiation, and cool hot surfaces. In addition to water, fire-extinguishing agents include chemical and pressurized foams, carbon dioxide, nitrogen, powders, water vapor, and substances that stop the chemical reactions of combustion. Fire-extinguishing agents are applied at the base of the fire through the use of fire-fighting equipment; equipment includes fixed devices for fire extinguishing, fire engines, fire trains, fireboats, fire pumps, and fire extinguishers. Fire protection services and the supervisory personnel of individual facilities see to the measures needed to prevent and extinguish fires. Benson, S. Termokhimicheskaia kinetika. Moscow, 1971. (Translated from English). Monakhov, V. T. Metody issledovaniia pozharnoi opasnosti veshchestv. Moscow, 1972. Demidov, P. G., V. A. Shandyba, and P. P. Shcheglov. Gorenie i svoistva goriuchikh veshchestv. Moscow, 1973. What does it mean when you dream about fire? Fire, like many familiar elements from everyday experience, is a complex symbol. It can symbolize passion, anger, the spirit, cooking, purification, transformation, illumination, and destruction. Our language contains expressions like “being fired,” “getting fired up,” “getting burned,” and “passing the torch.” The particular meaning of fire in a dream can be determined from other cues in the dream landscape. The manifestation of rapid combustion, or combination of materials with oxygen. To blast with gunpowder or other explosives. A warning that a shot is being fired. The discharge of a gun, launching of a missile, or the like. The projectiles or missiles fired. This is a very complex symbol that can have both negative and positive connotations. When interpreting this dream, you need to consider all of its details and your emotional responses in the dream. Fire can be a deeply spiritual symbol representing transformation and enlightenment. On the other hand, it could represent danger, anger, passion, pain, or fear. Is the fire in your dream destroying something or simply warming you? Are you currently engaging in negative behaviors or are you knowingly making wrong (or destructive) choices? Your unconscious mind may be warning you and at the same time encouraging you to alter those things in your life that may be hurtful and dangerous.